Hail Crufts. 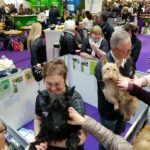 That annual pageant of the most stunning dogs - or the most determined dogowners - was back at Birmingham NEC this weekend, as were the stalwarts of Scottish Terrier Emergency Rescue Scheme (STECS) and London Scottie Club. Unlike in previous years, however, it was also, as TV presenter Clare Balding said, a contest in which terriers were prominent. I daresay, Scotties loomed large too. 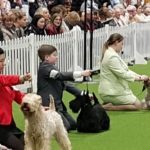 First of all, a Scottie won the terriers section of the Young Kennel Club contest, as you can see from the photos of the boy handling this proud pooch below. 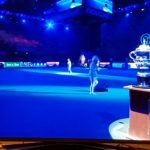 Secondly, the nephew of 2015 Crufts winner Knopa was in the final for Best In Show, with the same dog handler as the Russian-resident. 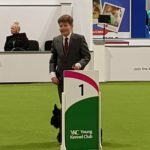 STECS had a pen at Crufts on Friday and were paid a visit by Channel 4 TV, Kennel Club TV and also Prince Michael of Kent. 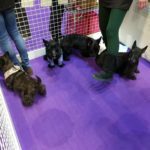 They all came to meet with Madge, the 15-year rescue, as well as elegant Brindle Oliver, Savannah, Angus and the lovely wheaten Bunty. 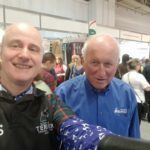 STECS London reps Susan Page and George Matlock, both of whom are also members of the London Scottie Club, were also on hand as the public expressed a lot of interest in Scotties. 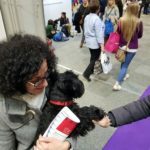 One lady said "I will have that one," pointing to the Brindle, only to discover that all the dogs on show were in fact happily re-homed, and we were volunteers not sales assistants. 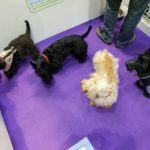 Taking a break to wander around Hall 3, I walked passed the Young Kennel Club, and spotted a terrier competition, complete with a Scottie. I took a few snaps and then decided to wait for the result. Well, seems I brought some good energy to the decision, as the Scottie won and was to appear in the Sunday final for that event too. One of the other highlights of the event was learning about the exciting new patronage for STECS. Ben Parkinson MBE, came along and became a media sensation himself. The injured paratrooper from Doncaster, who lost both legs in combat, was appointed an MBE by Prince Charles in 2013. Lance Bombardier Parkinson, who carried the Olympic flame at the London 2012 Games, suffered more than 40 injuries in a bomb attack in Afghanistan in 2006. As well as brain damage which affected his memory and speech, he also broke his pelvis, his back in four places, and shattered his arm and chest. 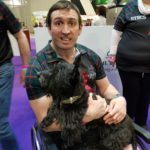 Ben owns two Scotties, his "Scots Guards" and not only did the pooches help him in his recovery, the experience led him to sign up as STECS patron. 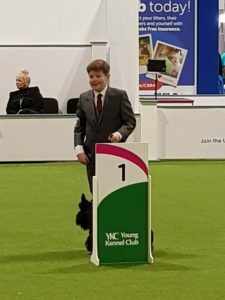 You can learn more about Ben in this Kennel Club TV video filmed at Crufts. Also, here we find out more about how Ben, who has raised over 1 million pounds for charities, can help STECS. Now onto the final, Best In Show, held at the culmination of the event on Sunday night. 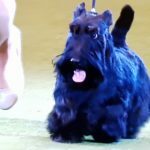 We were all thrilled to learn that a Scottie was again in the final! Would it be a repeat of 2015 when a Scottie won the contest, the first since 1929? Well, in some ways it was. The dog handler was Rebecca, whom many of you remember handled Knopa, the US-born but Moscow-bound 7-year-old winner. Knopa's registered name was the long but fairly memorable name of McVans To Russia With Love. Ok, some protested that she mishandled Knopa as a storm erupted that she steadied the dog by its carrot-like tail. Nothing wrong with that since Scotties are ratters and in the past they would have been pulled out of holes using this technique. These days, however, we are milder with our pets. If that wasn't enough of a deja vu, it turned out that the latest finalist, with the mouthful registered name McVan's Big Bopper Boy At Beameups, but known by the pet name "Bopper", is the nephew of Knopa and Bopper is also owned by Rebecca. 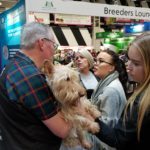 As Azis Toktobaev, one of the trainers of champion Knopa, told London Scottie Radio, the podcast section of London Scottie Club, Bopper was born on 28 November 2014 and lives in Pennsylvania. Bopper qualified for the final by winning Best of Breed and Best In Group. 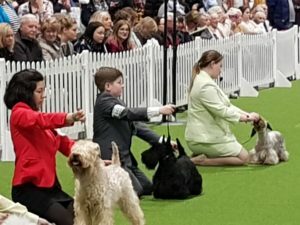 As you could see on the night, this Scottie, barely four years old, moved with the determination and focus of a pro, and was enough to move Clare Balding and her co-presenter to say the winner might be a toss up between the Akita and Bopper. As it was, neither dog made it, with reserve going to a Pointer and first place to a Whippet. But just as the winners assembled, a protest was staged in the ring and security drafted in to disperse the altercation. I am pleased to confirm that these were not Scottie Vigilantes. 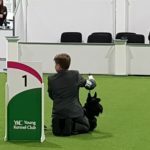 Scottie owners are, like their breed, far too dignified for pointless stunts. Can I rest my paw on your hand mate? Working the room is hard work!